Tapas is synonymous with Spanish food and these days you can find a wide array of them from the most classic that keeps things simple, to the most modern techniques and flavours. Here’s a list of Ibiza’s best tapas bars. Definitely most on the traditional side, this authentic Spanish taverna serves some good, hearty tapas. The most typical Spanish charcuterie and cheese can be enjoyed here in an informal and sociable, authentic setting. Located just off the buzzing Plaza del Parque, you can sit inside or outside in its porch whilst watching the world pass by. Bidebide was the first bars to offer the “pintxos” experience in Ibiza! It represents a true, traditional Spanish bar, with its simple exterior and crowded interior. The possibilities at this bar are nearly endless, with many different tapas and a yummy menu, everyone is bound to find something lovely, new and exciting to try. A hot favourite in Ibiza town, always bursting with locals and tourists. They serve some delicious Pintxos, which are small Basque tapas that get served on white bread. All parts of the Pintxos will be held together by a little cocktail stick and normally the different sorts get offered in form of buffet at the bar. Located right next to Can Terra, this is another local favourite choice for tapas. Its international fusion of flavours from around the world means you’re not just bound to local cuisine. If sharing food isn’t for you, or you just have a big appetite, you can also order à la carte from the menu too. More of a tapas restaurant than a bar, Rincon de Pepe has been serving clients since 1962 when it opened its doors at the beginning of San Antonio’s lively West End area. Family friendly and inexpensive, the tapas is traditional and of exceptional quality. Ibiza boasts some of the most breathtaking sea views in the world. From the famous West Coast and trendy South area, to the laid-back northern resort of Port de San Miguel, all the way to the secluded Sol d’en Serra bay on the East Coast. All of these areas offer spectacular vistas across the Mediterranean, not to mention the Ibiza’s magnificent sunsets. So if you love scenery and good food, make sure that you wine and dine at these top restaurants with a sea view. Balansat is a well-known seafood restaurant located in the northern resort of Port de San Miguel, once the fishing port of San Miguel village. It’s a very popular venue with the locals, right on the beach, so it’s a great choice for families that want to spend a day at the beach. Its charming outdoor terrace affords sweeping views of the Port de San Miguel Bay. 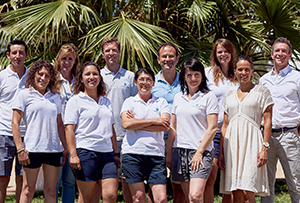 Aiyanna is situated in Cala Nova beach, the up-and-coming bohemian east area. They offer a delicious Eastern Mediterranean-inspired menu with mouthwatering seafood, mezze-style dishes, organic & seasonal produce grown in Aiyanna’s own garden and superfood salads. Vegans and vegetarians are well-catered too. There’s plenty of choices as well for those who love ethically-reared and sourced meat. Nestled on the hill overlooking the beautiful bay of Sol d’en Serra, Amante Beach Club is renowned for its fine dining. The restaurant’s large open-air terrace is what truly sets it apart as its panoramic sea view is truly spectacular. Executive Chef Domingo Fernández and his team are on hand to give you a truly mouthwatering dining experience, with eclectic dishes ranging from fresh seafood to its famous homemade desserts. For a taste of the glamorous side of Ibiza life, along with striking views of the harbour and Dalt Vila, head to Trattoria del Mar. It has long been a favourite of Ibiza’s social scene due to its vivid ambience. From its open dining room you can smell the sea and keep an eye on the comings and goings of the sleek watercraft that prowl the Marina. At dusk it offers an unparalleled vista of the old town with the warm light of the cathedral shining like a beacon. Situated on the headland at the north end of Es Cavallet, La Escollera’s perch is the definition of prime real estate. From is expansive terrace the white sand of Es Cavallet sweeps away to your right, the ink-blue sea breaks at your feet and to the left rises the ancient stone walls of Dalt Vila, the fortified heart of old Ibiza Town. See Boques is a must-visit when exploring Ibiza, for its authentic vibe. This long-established restaurant sits right on the beach. Feet in the sand, laid-back atmosphere under the Sabina trees and lovely views across the bay. It’s a traditional beach bar that kept all its existing charm. They offer a wide selection of seafood, paella and rice dishes to die for. As the name suggests, Es Torrent is situated on the calm Es Torrent bay, just few minutes from the trendy area of Es Cubells. Head here if you want to enjoy some delicious seafood, while having your feet in the sand. Its menu is chock-full of the most delicious Ibiza flavours: paella, grilled seafood, bullit de piex as well as Ibiza’s crayfish stew, lobster and baked fish. Cotton Beach Club offers an exclusive dining experience. 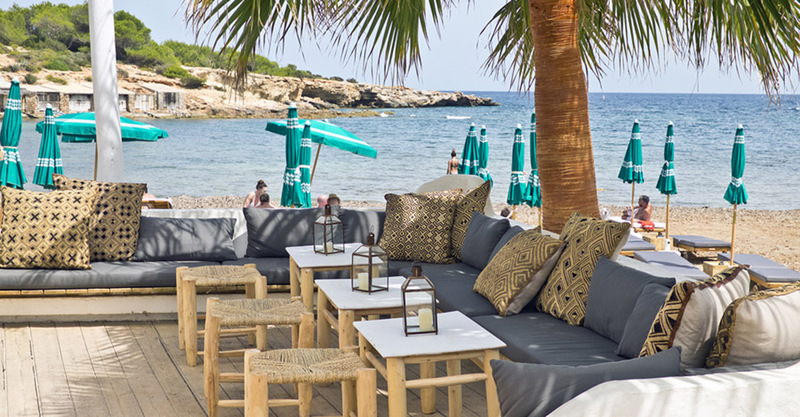 Situated on the West Coast, in Cala Tairda, this stylish restaurant boasts fantastic views across the blue Mediterranean sea, as well as Ibiza’s famous dazzling sunsets. You can expect an excellent menu, extensive wine list and welcoming atmosphere. Es Boldado is a rustic fish shack perched high on the cliff above Cala d’Hort. It offers a one-of-a-kind view of Es Vedra. You drive down a twisting gravel road to reach the restaurant and there is literally nowhere else on the island that gives you a similar overlook of the famous “magic rock”. It also serves some of the island’s best seafood. It’s cash only, so don’t forget to stop at the bank first! Fay, a sushi and Asian restaurant, opened in May 2015 on the roof terrace of The Cotton Club. We have given Fay it´s own listing as it is something a bit special. The setting is unparalleled with westward sea views as far as mainland Spain, 70km away at dusk. The food is mouth-watering and the service good. Overall it´s a great experience that should not be missed if you do not have too far to travel. It gets windy up there so the ladies should bring wraps. It Ibiza is a new arrival in Ibiza opening its doors in June 2015. It is in pride of place in Marina Botafoch (where the restaurant Madrigal used to be) with great views across the bay and marina to the beautiful old town. The food is modern Italian and the chef has two Michelin stars to his name back in his native Italy. The menu de degustacion is delicious. Excellent food in jet set surroundings. The Gran Hotel, Paseo Maritimo, near Marina Nueva. Ferran and Albert Adrià , the famous owners of El Bulli , have teamed up with Guy Laliberte, owner of Cirque du soleil, to open ‘Heart’ at the Ibiza Gran Hotel. The concept is a world-leading restaurant with living art performances. It is a formidable partnership and is proving to be a spectacular dining experience. It opened in June 2015. Make your reservation well in advance as it is proving a big success. Sa Punta restaurante has been around for a few years serving up nice Mediterranean food with lovely views back across Talamanca bay to Dált Vila in Ibiza old town. In 2014 ‘Patchwork’ , a Lebanese restaurant and cocktail bar, opened on the roof and in 2015 ‘Ginger’, with a sushi and Asian menu has also opened. So, there are now three restaurants in one offering a global array of delicious treats in lovely surroundings. A dinner restaurant offering high quality modern French cuisine in the stylish and intimate surroundings of the old El Ayoun restaurant in the centre of San Rafael. It has a much fresher feel to it than the old establishment and early reviews rate the food highly. Well worth a visit if you are not too far away. The best tapas on the island in a small bustling spot opposite the church. Well priced and excellent guidance on the food by Claudio the young energetic owner. A must visit spot if you are staying nearby. Carrer Santa Lucia, hidden in ta tiny plaza in the old town. If you can find it and you are in for a more alternative night then this is a great place. 1805 celebrates the founding of Absynthe and all the craziness that goes with this intoxicating spirit. Charles the French owner is a character to say the least. What they do they do well, very well. Great steaks and Moules Mariniere. Don´t get stressed about the service, it´s awful at times. Just relax and get eating and drinking and watching the club parades walking past in thongs and not much else. This is a fun slice of Ibiza and a warm up to something else. And if you want to stay in one of our delicious villas please get in touch. We have a extremely tasty portfolio of private villas up in the hills above some of these lovely restaurants. What better way to explore them? Es codolar bay on Saturday . When the waves get up they churn up the sand in Es Codolar making the waters a milky turquoise . It’s the bay you fly over when you land . Not a bad first sight of the island. The London Evening Standard names its best 8 beaches in Ibiza, and naturally our favourite Cala Jondal gets a mention. How many have you visited? Explore Ibiza’s beautiful waters by boat, and discover the stunning coastline with dozens of tiny coves. Soak up Ibiza’s intoxicating rays; take time to relax and enjoy an alternative view of the island. Get to into the hippy roots of Ibiza and head to Benirras beach. This romantic, breathtaking, cove inspires local people to come to together to create a ritual concert. Artists and musicians dance and play bongos to the last rays of light, celebrating the natural beauty of the island as the sun goes down.